Hanging Lake is one of Glenwood Springs’ most popular geologic wonders, with people coming for miles to view its pristine, turquoise waters and sparkling waterfalls. Located in Glenwood Canyon, it’s a steep mile hike up variable terrain, but the views at the top are well worth the effort. Beginning May 1st, a reservation will be needed to access Hanging Lake. In order to preserve and protect this natural beauty, the trail will support 615 people a day by way of Hanging Lake Express’ shuttle system, or by a biking/hiking reservation to the trailhead. The Hanging Lake shuttle and reservation system will provide efficient visitor transportation while protecting a National Natural Landmark! You can reserve spots for the shuttle beginning April 1st. Reservations can be made starting April 1st by visiting www.visitglenwood.com, or by phone: 970-384-6309. On May 1st, reservations can also be made in person by visiting the Hanging Lake Welcome Center, located near the Community Center at 110 Wulfsohn Rd, Glenwood Springs, Colorado. Not sure what to expect? Read this list of recommendations to prepare yourself, and click here to read the rules of visiting Hanging Lake. Have more questions? See below for more FAQ’s. 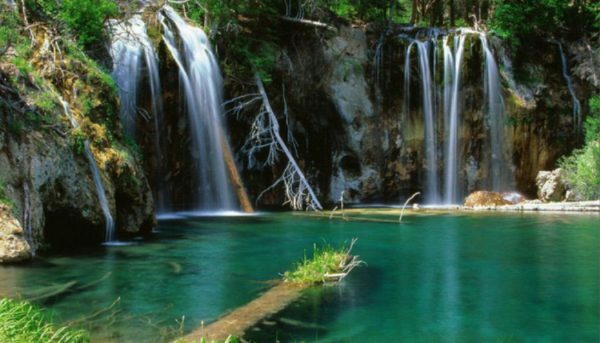 Question: How much does it cost to visit Hanging Lake? Answer: A reservation for the shuttle costs $12 per person. The experience includes: an online reservation system for convenient trip planning, reduced visitors on the trail for enhanced hiker experience, a dedicated welcome center for parking and shuttle pick-up in Glenwood Springs, on-site maintenance, ranger presence, visitor information services and interpretation on the trail and at the Hanging Lake Welcome Center. Question: Where do I go to make a reservation to visit Hanging Lake? Answer: Reservations can be made online beginning April 1, 2019, at www.visitglenwood.com/hanginglake. Reservations can also be made in-person beginning on May 1 at the Hanging Lake Welcome Center located at 110 Wulfsohn Road in Glenwood Springs, CO, next to the community center. Question: Where can I get more information to plan my trip? Answer: For more information please visit www.visitglenwood.com/hanginglake or call the Hanging Lake Information line at 970-384-6309. Customer service representatives will be able to answer questions beginning Monday, February 25, 2019. Email inquiries can be made at info@hanginglakeexpress.com. Question: When will the shuttle run? Answer: The 2019 shuttle season will operate May 1 – Oct. 31, daily. Shuttle schedules will be available online on the reservation system, beginning April 1, 2019. Question: Where do I park and get on the shuttle? Answer: Shuttles will depart from the Hanging Lake Welcome Center located at 110 Wulfsohn Road in Glenwood Springs, CO. Shuttle service will begin on May 1, 2019. Free parking is also available at the Hanging Lake Welcome Center. Question: Is there group size limit for reservations? Answer: Yes, there is a limit of twenty people per group reservation, larger groups must call 970-384-6309 to make additional arrangements. Question: Are there special rates for children, seniors and military? Answer: At this time there are not special rates for children, seniors and the military. Question: Is there a season pass for locals? Answer: At this time there is not a season pass option for locals. All visitors must make a reservation for $12. Question: How long do I have to hike to Hanging Lake and catch the return shuttle? Answer: Visiting Hanging Lake by shuttle allows for a three hour hike time there and back with additional time for photos and picnicking. 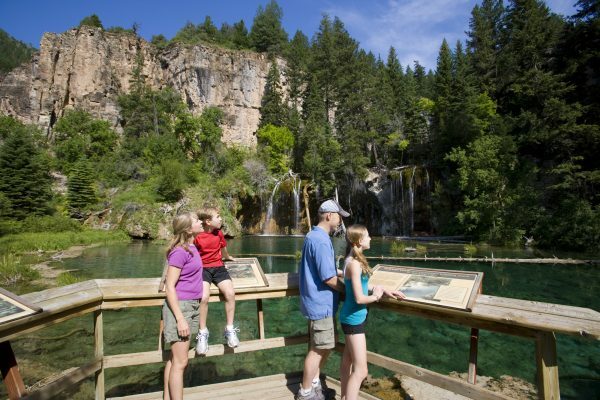 All visitors have a guaranteed return shuttle after a three hour visit to Hanging Lake. Hikers that take shorter or longer than three hours will be on standby to get back on the next available shuttle. Question: Are dogs allowed at Hanging Lake and at the Hanging Lake Welcome Center? Answer: No, dogs and/or other pets are not allowed on the Hanging Lake Trail or at the Hanging Lake Welcome Center. Please visit www.visitglenwood.com/hanginglake for dog-boarding options. Question: Are there restroom facilities at the Hanging Lake Welcome Center or at Hanging Lake? Answer: Yes, there are restroom facilities available at the Hanging Lake Welcome Center. Additional amenities at the Welcome Center include a water fountain, gift shop and visitor information services. Restroom facilities are available at the Hanging Lake trailhead along with a water fountain and picnic tables. Restroom facilities and drinking water is not available along the trail or at the lake; please pack water and snacks with you and remember to pack it out and Leave No Trace! Question: How long is the Hanging Lake trail? Answer: The hike to Hanging Lake is a moderate to difficult hike up into a narrow drainage for 1.2 miles with over 1,000 feet of elevation gain. 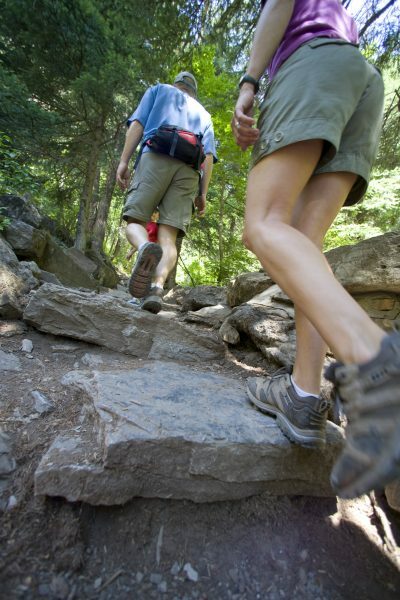 It is important that hikers are prepared for elevation, strenuous climbs, and rocky conditions. Bring water, snacks, sunscreen and appropriate footwear and clothing. Question: Is there cell service at Hanging Lake? Answer: There is no cell service at Hanging Lake. The area will be staffed in case of an emergency during the peak season. Question: Do I need a reservation year-round? Answer: Yes, during the peak season, May 1-Oct. 31, a reservation is required to visit Hanging Lake either via shuttle, hiking or biking. There is a daily limit of 615 visitors per day. The Forest Service and H2O Ventures will provide onsite visitor services and compliance daily. During off-peak season, Nov. 1-April 30, a reservation is required to visit Hanging Lake via independent vehicle, hiking or biking. Forest Service Rangers will patrol the trail and parking area to ensure visitors have obtained a reservation. Question: Do I need a reservation to bike to the trailhead to visit Hanging Lake? Answer: Yes, bikers/hikers need a reservation and can bike to the trailhead and hike to the lake, year-round at any time. Question: Will I be able to access the Hanging Lake parking lot? Answer: When the shuttle is in operation from May 1 through October 31, the parking lot will be closed except for Hanging Lake shuttles, emergency vehicles or other authorized vehicles. Take-outs of larger boats, SUPs, and rafts will not be possible during this time period. During the off-peak season, the parking area is reserved for emergency vehicles, authorized vehicles and for visitors hiking to Hanging Lake. 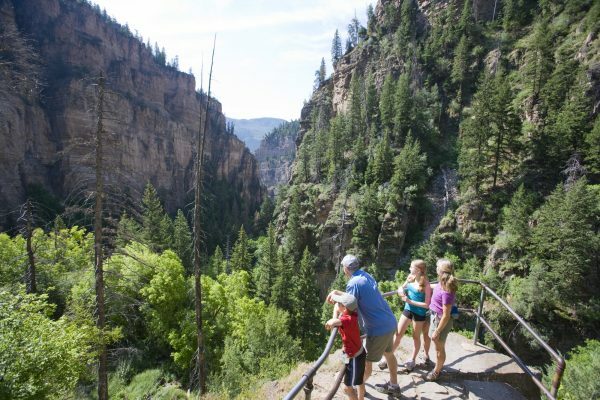 It is recommended that those wishing to utilize the Glenwood Canyon bike path do so from another Glenwood Canyon access point such as Grizzly Creek, No Name or Bair Ranch. Visitors who want to hike to Dead Horse, located along the Hanging Lake trail, will still need to purchase a reservation to do so. Question: I don’t want to hike to Hanging Lake, but I do want to utilize the Glenwood Canyon bike path, do I need a reservation? Answer: No, you will not need a reservation if you are not hiking to Hanging Lake. Question: What is the ultimate goal of the Hanging Lake Management Plan and the reservation system? Question: Will any of the revenue collected directly benefit Hanging Lake? Answer: At a minimum, 5% of overall revenue goes back toward the partnership and long- term sustainability of operations and management of Hanging Lake and stewardship of this special place. The partnership allows for the City and the Forest Service to cost share and to cooperatively develop, plan, and implement projects that are mutually beneficial to the Hanging Lake area and provide local residents, as well as the American public, with high quality recreation experiences and excellent customer service.